Every year, in spring but also in fall, horses put on their new coat and replace almost all their hair, a real performance. That's why your horse may look tired as the sunny days approach. If you have the opportunity, it is best to clip your horse before spring so that the moulting period is less restrictive. You will also be less bothered with the issues of sweating and drying your horse. Be sure to cover your horse depending on the temperatures. The daytime temperatures increase gradually but the nights are cold which can cause you to change blanket several times a day. Note that the coat is the barometer of your horse’s good health. If he has a dull and rough coat, consider giving him cod liver oil that is very rich in vitamin A and D. Vitamin A helps moisturize the skin and helps your horse find a shiny coat again. For some horses the rhythm of competitions slows down during winter and for others, it even stops. The work schedule is lightened and the food intake reduced, resulting in a decrease in minerals and vitamins intake. The end of winter is also synonymous with moulting in your horse and this period can sometimes be accompanied by a weakening of the immune system. Supplementary foods can help your companions cope with this transition period and we'll see why. A few weeks before returning to competitions, horses gradually resume a more sustained pace of work. For some of them, returning to work at this time can be a bit complicated. It may therefore be beneficial to support them in terms of nutrition so they can resume this new rhythm in good conditions and develop their muscle mass. During this phase, it is mainly a question of balancing the energy intake with the energy expenditure linked to the activity of the horse. Remember that the main source of energy in the horse is the cell walls (also commonly referred to as "fibers") of fodder and the second source, starch, found in cereals. In a second step, we will seek to rebalance the intakes in minerals and vitamins. If your horse runs out of muscle mass, protein supplementation may be recommended. It will then be necessary to maintain a sufficient level of activity at the same time as the supplementation. The options to supplement your horse are many but remember that each athlete is specific. Do not hesitate to ask your veterinarian for advise to choose the most appropriate formula according to your horse and goals set for the season. Some horses can feel a bit week when moulting. Indeed, to form a new coat, the body of your horse needs a lot of energy, and many elements such as amino acids, minerals, vitamins and trace elements. The immune system is weakened in case of lack of these elements. 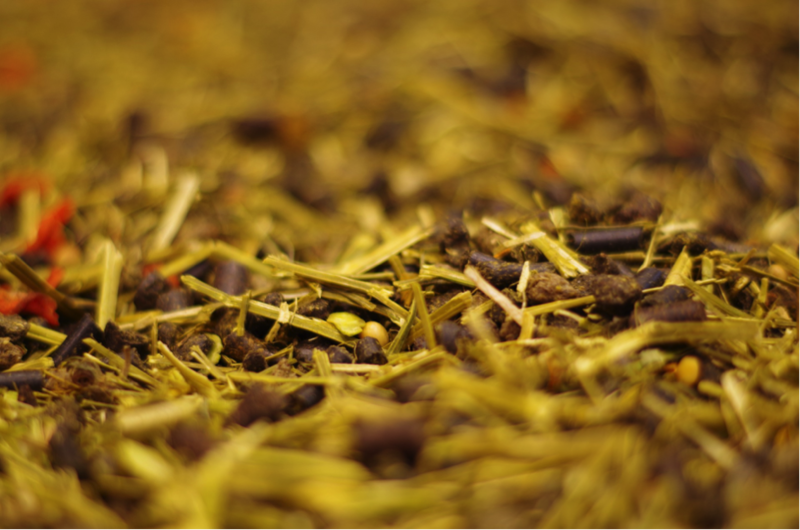 A cure of multivitamin supplementary foods over a period will therefore do a world of good and will provide the trace elements and nutrients necessary to maintain a good general condition and boost the immune system of your horse. Once again, there are many supplementary foods and we recommend that you seek the advice of your veterinarian to choose the best solution for your horse. Hoofs deserve special attention in this season. If your horse has been out wintering, he may have soft feet due to moisture. Take advantage of shower sessions to clean the soles. After picking out your horse’s feet, use a hard-bristled brush to scour the gaps. Once dry, use fortifying ointment that contains some pine tar. If your horse has really soft or smelly frogs, a pine tar will help them harden. Spring is also the time to think about changing the ointment. If you used a black ointment during winter, switch to a blond or green ointment for spring and summer. 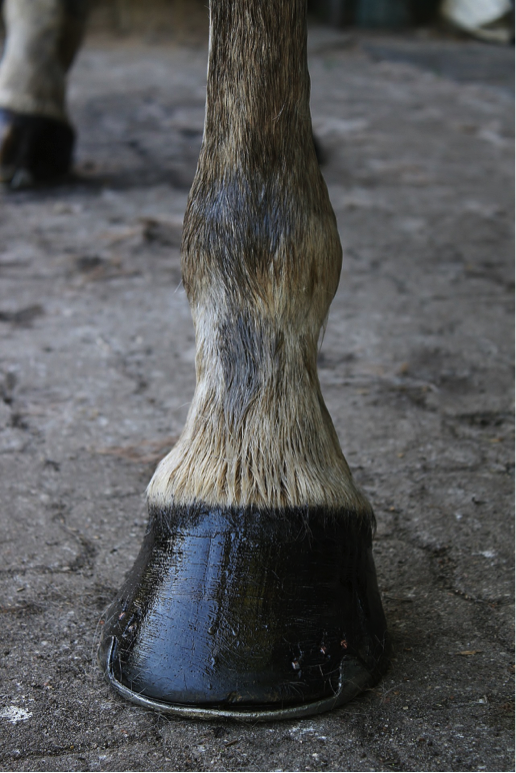 They contain laurel oil or lanolin which offer a strong hydrating power for hooves. A cure of biotin will also be ideal as it has the advantage of being excellent for the coat and the feet. Biotin is a natural antioxidant and is full of vitamin E.
The majority of horses were confined inside and fed with a hay/grain intake for several months of the winter. Like all dietary changes, getting back on fresh and lush grass must be done gradually to avoid digestive problems. Feed your horse with hay just before taking him out or leave hay available on pasture until the grass is mature. When horses have full belly, they are less likely to eat too much when back on grass. Do not let him graze for more than 30 minutes the first days then gradually increase the time spent in the pasture the following weeks. 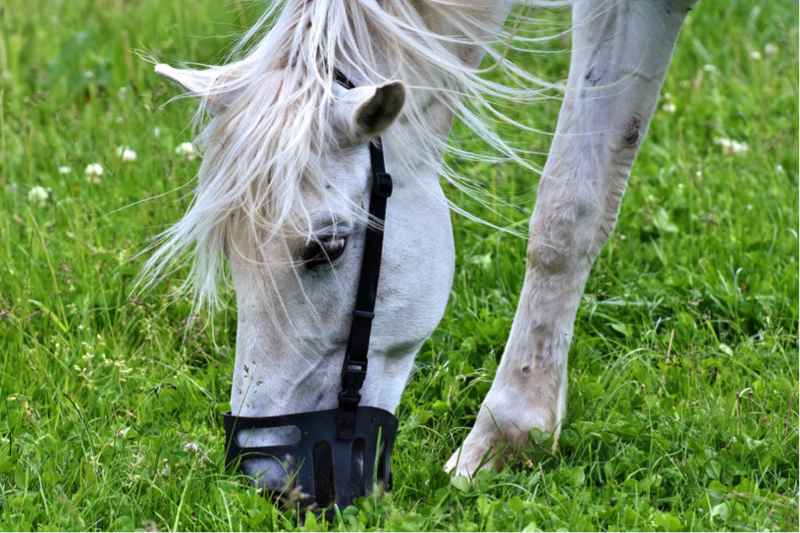 Use a grazing muzzle as needed if you cannot make a gradual transition. Do not hesitate to cover him at the beginning in case of low temperatures. Pay special attention to poisonous plants. In spring, young shoots are sometimes very different from the adult plant, making them difficult to identify. So be careful, open your eyes in your pastures and find out about these plants. In addition to the development of muscle mass, you must also take care of the general condition of your horse and the small deficiencies that may arise at the end of winter, especially in the musculoskeletal system. Small aches can appear with the resumption of a more sustained training. It is therefore important not to neglect the warm-ups. With the arrival of sunny days and turnout, it is also time to think about worming your horse to protect him from spring parasitic infestations. After worming, be sure to remove the dungs from the meadow or stable in which your horse lives, or to change meadow. Also be sure that all the horses that your horse rubs shoulder with are also wormed. If not, their dungs will have larvae, and your horse may be infested again. Note that if you have a mare, spring is the period of the ovarian activity recovery. Watch out for changes in behaviour that may occur. Some of them become a little rebellious and it is sometimes good to give them a few days of tranquillity. Others cannot stand the contact of other horses, which can cause problems at work and in the field.